Treatment plants use the action of natural aerobic bacteria to clean sewage effluent to a level much higher than that obtained through septic tanks. This reduces the possibility of damage to soak away and treatment systems are particularly useful where soil has a low porosity. Treatment plants use mechanical systems to aerate the sewage effluent, but are generally very quiet in operation, and – when correctly maintained a de-sludged – they should not cause any odour problems. Like septic tanks, they should be emptied of solid waste at least once a year. For information about the size of treatment plant your property may require, contact us for free advice. 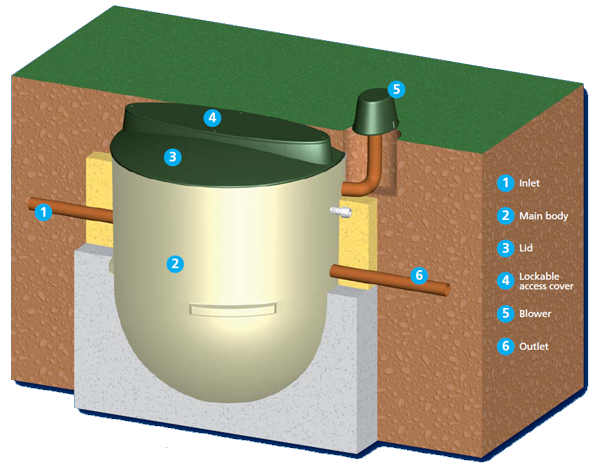 When considering a new system, it should be noted that any discharge, from either a septic tank or treatment system, is subject to a discharge consent approval from the Environment Agency. You can download guidance notes and an application form for consent to discharge from the EA website.